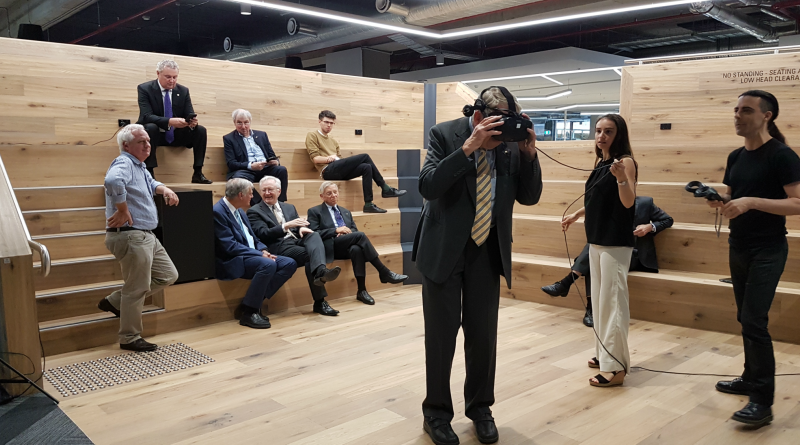 Senate member Alec Brennan with head set on experimenting with 3D technology in the Huddle with University of Sydney Senate members prior to their sitting at Westmead Hospital. For the first time, the University of Sydney held its Senate meeting at Westmead Hospital’s new Westmead Education & Conference Centre (WECC) level one. The senate also enjoyed a lunch, which was attended by representatives from Western Sydney Local Health District (WSLHD) and the broader precinct,. WSLHD board chair Richard Alcock and Westmead Redevelopment executive director Leena Singh were in attendance, along with representatives from the precinct’s research institutes and the Children’s Hospital at Westmead. The University of Sydney’s Senate oversees and reviews the management of the university and its performance.